With Toshiba’s UK nuclear energy subsidiary NuGeneration officially entering administration in January, the team at Leeds Trailers decided to provide an overall update on power station plans in the UK. The Moorside Nuclear Power station plans were part of Toshiba’s subsidiary NuGeneration. With NuGeneration in administration, the future of Moorside is uncertain. In November it was reported that the project was scrapped. In January, four local MPs, local councils and members of the nuclear industry have formed a new group in Cumbria to promote the benefits of continuing with the Moorside plans. The Department for Business, Energy & Industrial Strategy still views Moorside as a viable option. Although NuGeneration will no longer develop the nuclear power plant, it may still be built. Hinkley Point C is the first of several new generation nuclear power plants that are being developed by the EDF Energy and CGN partnership (China General Nuclear Power Corporation). Once fully operational (2025) it will use two EPR reactors to generate low carbon electricity. It is a key part of the UK’s plans to reduce the country’s overall carbon dioxide emissions. 64% of the projects construction value is forecast to go to UK firms with £700m worth of contracts being confirmed so far. 25,000 jobs and 1,000 apprenticeships are expected for the plant. The construction of Hinkley Point C has started. It took seven years of planning and development to start construction. The plant is forecast to bring £4bn to the regional economy. It is the only new nuclear power station that has officially started construction. Another new generation nuclear power station has been proposed. The project is also by EDF Energy and their partner CGN. The proposal is in stage 3 of the planning consultation process. If approved, it is forecast to be worth £3.4bn to the economy and is expected to be complete by 2031. The worth to the economy includes £100m a year during construction and £40 million a year for 60 years (the planned operation time of the two reactors). It is forecast to generate low carbon energy for six million homes and would generate 900 jobs in Suffolk. Another EDF Energy and CGN project is the Bradwell B nuclear power plant in Bradwell-on-Sea in Maldon, Essex. The plant will be developed using a third-generation pressured water reactor called the UK HPR1000. If approved the plant will neighbour the decommissioned nuclear plant Bradwell A. The technical assessment work is currently under way, which will be the core of the emerging proposals. The project is at the very early stages of development. The subsidary Horizon Nuclear Power owned by Hitachi was set to develop two new generation low carbon nuclear power plants in Wyfla and two more in Oldbury in Gloucestershire. In January 2019, Hitachi pulled out of both projects. Despite this, Horizon Nuclear Power have announced that they want to proceed with the £20m Wylfa nuclear power plant. The Oldbury plans have been scrapped. Solutions for keeping the two Wylfa plants’ proposals on track are being discussed with stakeholders and the government. Sizewell B is currently the only pressured water reactor (PWR) in the UK. It has been operating since 1995. Sizewell B is part of 16 reactors that are currently operational. Plans are in place to retire 15 of the 16 power stations by 2030 (One of these is Bradwell A in Essex). Sizewell B is the only old generation plant that will continue to operate. At Leeds Trailers, we stay informed with UK construction plans. 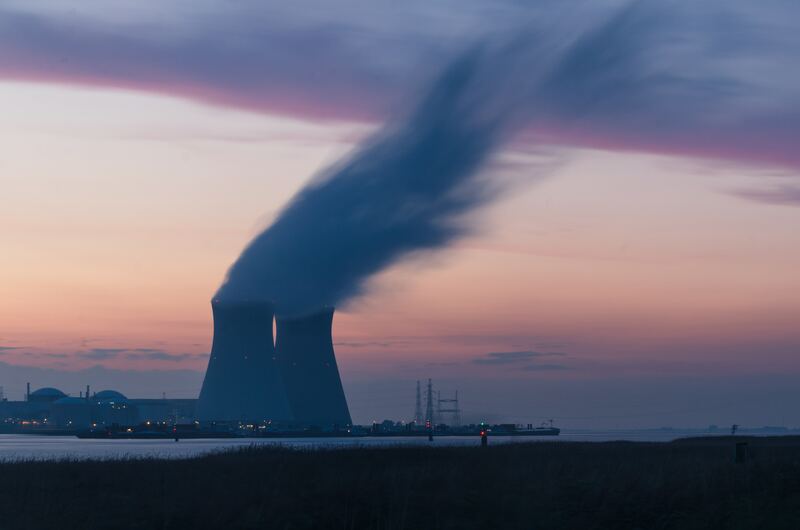 Toshiba and Hitachi pulling out of nuclear power station developments shook the UK’s nuclear industry at the end of 2018. However, there’s now new support for some of the scrapped projects. At Leeds Trailers we offer a variety of specialist trailers that are suitable for construction or specialist heavy goods transportation. You can hire extendable trailers or other specialist trailers from our trailer hire fleet. Call our team on 01924 420 646 today to enquire.